Most people install Google Chrome from the official website which is http://www.google.com/chrome. Clicking the big blue Download Google Chrome button will first download the Google Chrome installer (ChromeSetup.exe) which is only 716KB in size. The installer will then download the latest Google Chrome to install it on your computer. Since Windows 95 until the current Windows 7, most if not all third party software is recommended to install in Program Files folder so that we can easily keep track of what software that has been installed on the Windows computer. If you haven’t noticed, Google Chrome by default installs to AppData folder instead of Program Files. The good thing about installing Chrome in AppData folder is it doesn’t require UAC elevation so any user including Guest account will be able to successfully install without problems. However, for advanced users that prefers to keep all installed software in a standard location which is the Program Files, here is how to do it. The easiest way is to uninstall the current Google Chrome from Control Panel and then download the alternate offline Google Chrome installer for Windows which the setup will install Chrome in Program Files folder. When you uninstall Google Chrome, make sure that the option “Also delete your browsing data?” is unchecked so that the extensions, cookies and caches will be retained. 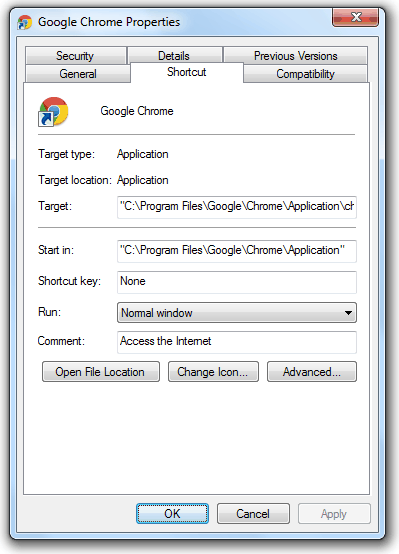 Do note that installing the offline Google Chrome will prompt the User Account Control window asking you to allow the following program to make changes to your computer. Click the Yes button to continue. Another advantage of the offline Google Chrome installer is you can reinstall or install it on multiple computers without redownloading the whole web installer, saving both your time and internet bandwidth. For those interested, the so called “Enterprise” MSI can be found at google.com/intl/en/chrome/business/browser/. That one did install Chrome under Program Files, alright and did start up correctly. Only the installation lasted for ever, as compared to the “normal” Chrome install. But that’s not what I want. As from the early eighties, I always tried to keep my Roots (and, later, Program Files also) as clean as possible, well knowing that MS is the worst culprit here (when they do give you a choice, as for Office XP, there definitely will be some features not working correctly!) Others like Java will install where you want it, but then the likes of OOo or Libre Office will often complain they need… Java to be installed! I just hate those programs that go where they choose! So I uninstalled this Chrome and tried Raymond’s link instead. Here Google calls it just Standalone as opposed to Standalone Enterprise. Before installing I checked whether “User Data” was still there. It was (did back it up, just to be sure though). And here, it all went wrong. Again, no choice for my preferred folder (the one housing my browsers – except IE, of course – and everything around them), but worse, as I later found out: back to… AppData it went. Installation took for ever, then, Chrome tried to start and twice, after agonizing long minutes, complained it could not find my profile. Note that I am the sole user, ergo full administrator of my PC’s. In between, it completely froze my PC! After about a quarter of an hour, Chrome eventually did start and displayed… my default page. Well, well, thought it didn’t find or was unable to use my profile (it even added about 25 MB to my User Data – crap I guess). I’m now definitely ousting that villain ;-(( If a Chromium flavor it has (sometimes) to be, well then it will be the much safer Comodo (which also doesn’t continually feed the huge Google databases!). I don’t understand what you mean by 716KB, I installed google chrome and its about 160+ MB, I also installed Coolnovo and that is close to the same. The “web installer” is 716KB and this small sized installer will download the latest Chrome files to your computer. A essayer, Comodo Dragon. C’ est Chrome sans les inconvénients! You can always go to Google Chrome About and it will autoupdate and ask you to restart Chrome. I find that better than silent updates. But i think offline installer cant receive auto updates. The most problematic thing in chrome is you have to install it separately to each user account, but this nuisance is only when installing from online installer. I don’t think so. There is a version for multi users, which I have installed. thanks a lot. saves a lot of time. Installing offline disadvantage is that it does not come with Google Service to Silently update it. Also the solution is simple and is to download MSI package of Google Chrome which is Stable only. whats the download location/link for this msi?